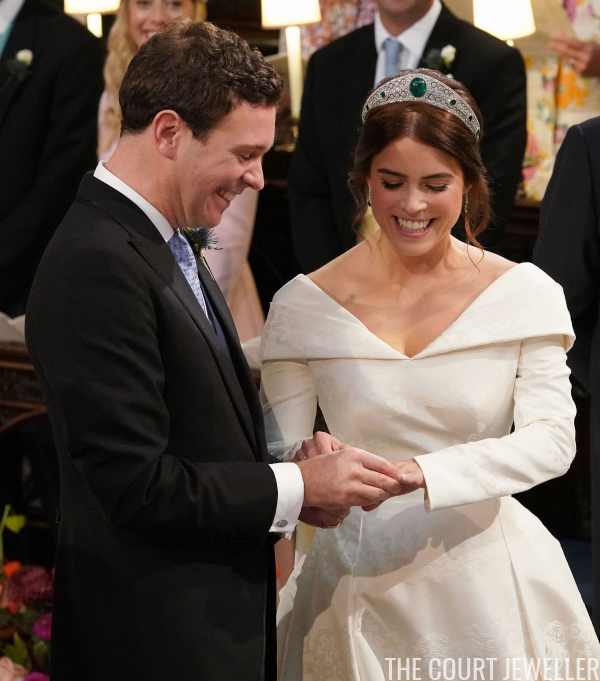 HRH Princess Eugenie of York is now officially HRH Princess Eugenie, Mrs Jack Brooksbank! And, of course, we've got all the details on her royal wedding jewels! 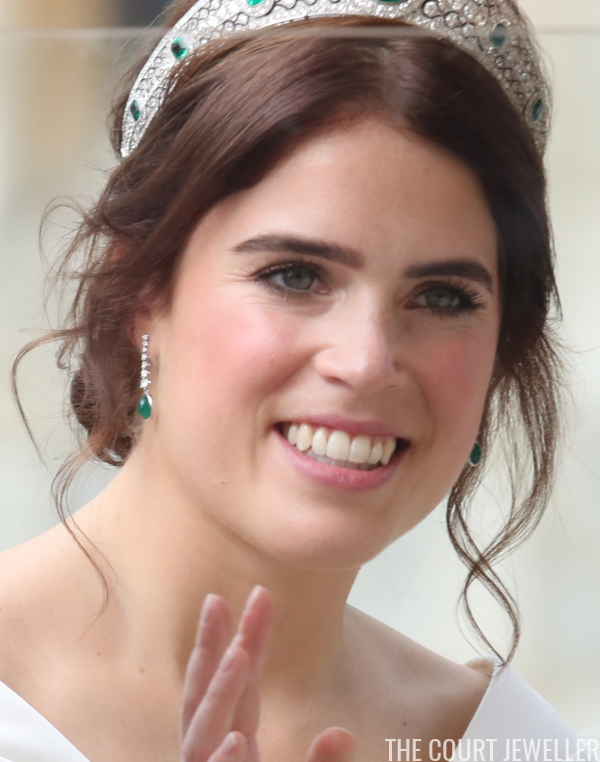 Eugenie gave us all a surprise by not choosing her mother's wedding tiara, the York Diamond Tiara, opting instead to borrow a diadem from her grandmother, Queen Elizabeth II. 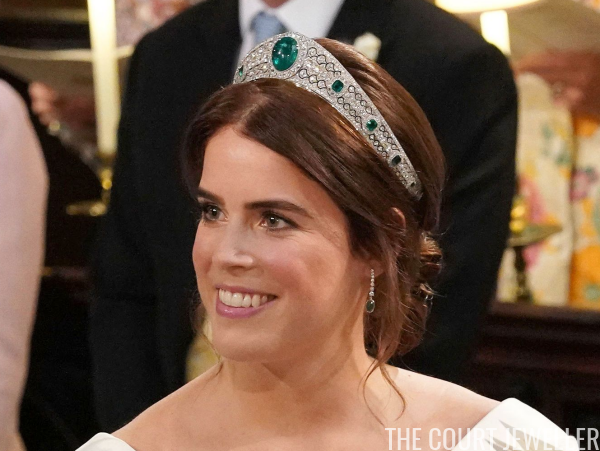 The tiara is the Greville Emerald Kokoshnik, made for the Hon. Mrs. Ronnie Greville by Boucheron. Previous literature on the tiara had suggested a creation date of 1921, but the palace states today that it was made in 1919. The tiara features a stunning central emerald cabochon stone. Mrs. Greville bequeathed the tiara (and a boatload of other jewels) to the Queen Mother in 1942, but until today, no member of the royal family had ever worn it in public. The Queen inherited the tiara from her mother in 2002. 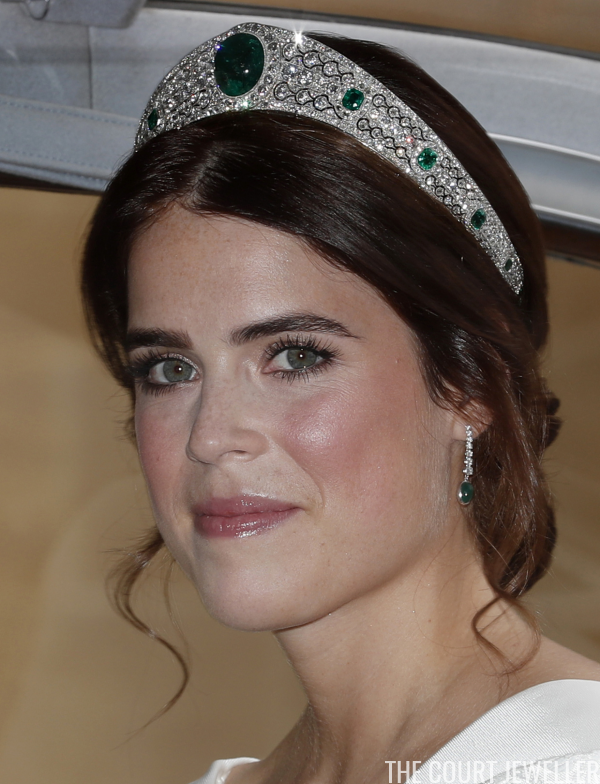 Eugenie's diamond and cabochon emerald drop earrings were a gift from her new husband. 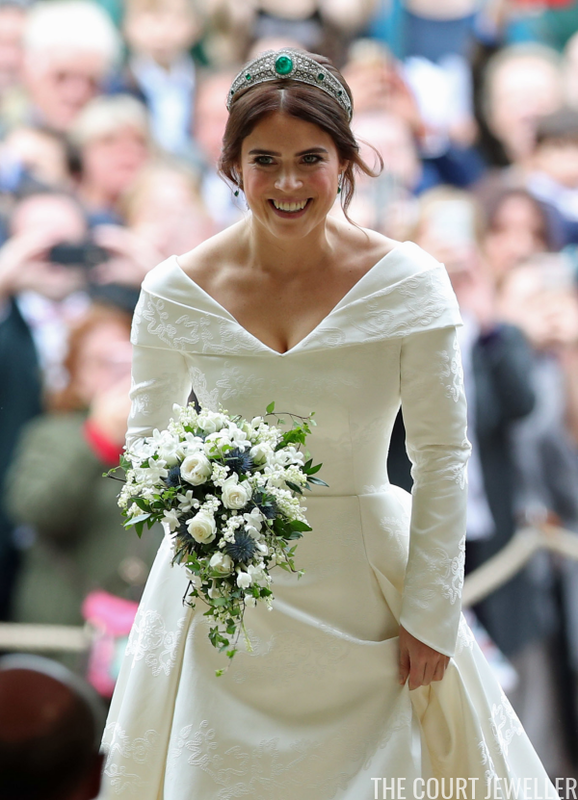 Following family tradition, Princess Eugenie's wedding ring was made from a piece of Welsh gold given by the Queen. Eugenie's padparadscha sapphire and diamond cluster engagement ring was visible on her right hand. 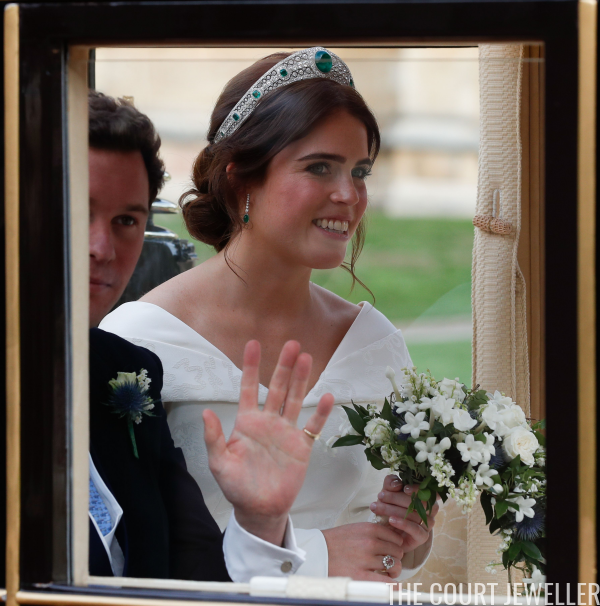 Eugenie paired her jewels with a wedding gown by Peter Pilotto and Christopher de Vos. 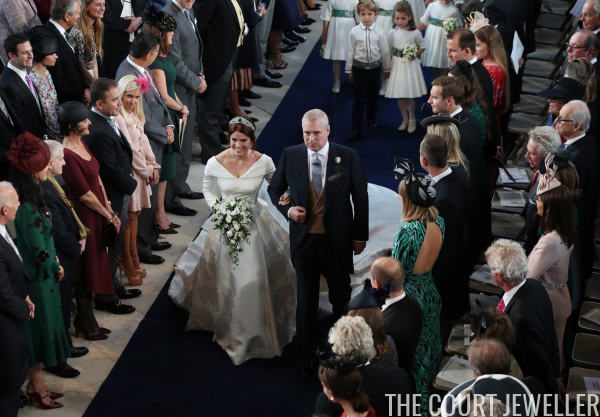 She opted not to wear a veil with the tiara -- possibly because the back of the gown had been specifically designed to show the scars from her childhood scoliosis surgery, and a veil would have obscured that deliberate design detail. I love the tiara choice for three reasons in particular. Eugenie is often said to resemble a young Queen Mum, so the choice of a tiara that belonged to her great-grandmother was a lovely one. Emeralds have also become something of a growing trend for royal brides, as we've previously discussed here. And, of course, I love a surprise jewelry moment from out of the royal vaults! 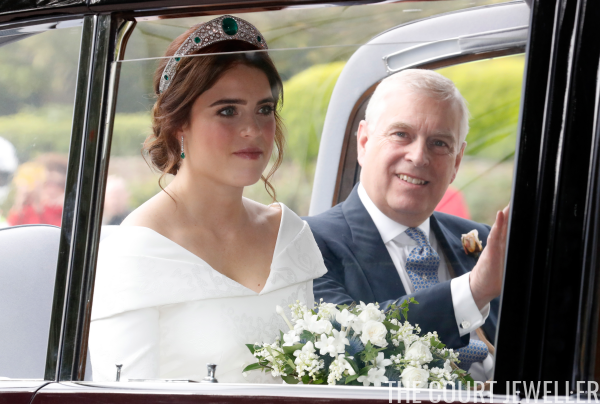 What did you make of Princess Eugenie's royal wedding jewels?